Synthetic peptide corresponding to Human NUP133. HeLa, Ramos and SH-SY5Y cell lysates; HeLa cells. Our Abpromise guarantee covers the use of ab155990 in the following tested applications. WB 1/1000 - 1/10000. Predicted molecular weight: 129 kDa. Involved in poly(A)+ RNA transport. Belongs to the nucleoporin Nup133 family. Immunocytochemistry/ Immunofluorescence analysis of HeLa (human cervix adenocarcinoma epithelial cell) cells labeling NUP133 with purified ab155990 at 1:50 (6.5 μg/ml). Cells were fixed in 4% Paraformaldehyde and permeabilized with 0.1% tritonX-100. Cells were counterstained with Ab195889 Anti-alpha Tubulin antibody [DM1A] - Microtubule Marker (Alexa Fluor® 594) 1:200 (2.5 μg/ml). Goat anti rabbit IgG (Alexa Fluor® 488, ab150077) was used as the secondary antibody at 1:1000 (2 μg/ml) dilution. DAPI nuclear counterstain. PBS instead of the primary antibody was used as the secondary antibody only control. Unpurified ab155990 staining NUP133 in mokey kidney cells by ICC/IF (Immunocytochemistry/immunofluorescence). Cells were fixed with paraformaldehyde and blocked with 3% BSA + 0.5% Triton X-100 for 45 minutes at 25°C. Samples were incubated with primary antibody (1/1500 in 3% BSA + 0.5% Triton X-100) for 45 minutes at 25°C. An Alexa Fluor® 647-conjugated donkey anti-rabbit IgG polyclonal (2 µg/ml) was used as the secondary antibody. This image was produced using unpurified antibody. 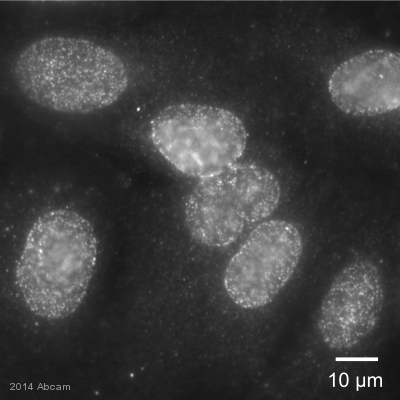 Immunofluorescent analysis of HeLa cells labeling NUP133 with unpurified ab155990 at 1/50 dilution. This image was produced using unpurified antibody. Publishing research using ab155990? Please let us know so that we can cite the reference in this datasheet.